There are moments in my life when I feel invisible. As a non-married, childless middle-aged adult, I often get left out of family and friends’ activities because I’m not a couple or have kids. As a female entrepreneur, my work is not considered a career; it’s considered biding my time until I find a ‘real’ job. And the money I spend is thought to be wasteful because in the eyes of others I have no reason to be spending money. And don’t even get me started when it comes to sibling rivalry that we never outgrow. For this Thanksgiving, I am shifting my thinking and changing the message I’ve told myself over and over. Although not easy to break the endless recording that’s been playing in my head since childhood, it’s about time I do it so as to step into my own light (spiritually and physically). Instead of feeling like I have to compare myself to others, be included in all activities or be told of all significant life events, I will keep moving forward with my life, in my own way, and not worry whether our paths cross or run parallel. I will focus on my journey, be grateful when included in theirs, and shake it off when not included in theirs. Yes, I’m still that square peg desperately wanting to fit in that round hole. But as I get older I’m beginning to realize what a waste of time that struggle is. I’m much better off appreciating who I am and finding my own square hole to fit into. And, most importantly, family is all we have when push comes to shove. They love me and I love them unconditionally. At times we may not like each other, but we always love and support one another. My health. I am so blessed. Yes, I have MS and I’ve had a litany of other issues and I am well. So many other people I know are facing life-threatening challenges and all I can say is, “Thank You” to God for keeping me well. Being aware of these things helps me to change my negative self-talk and replace it with a positive message. I am someone who is living a life that matters by making a positive difference in the world. I am riding an incredible wave of this journey we call life and my blessings are immeasurable. 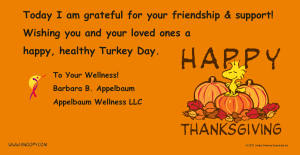 Wishing you a health and joyous Thanksgiving holiday!